Most of us who carry the responsibility of on-site construction projects know efficiency is critical to staying on schedule and budget. Years ago, many contractors would send a laborer to the job site before the carpenters would arrive to roll out the electrical cords as part of the daily set-up process. Not using more expensive man hours for set-up work saved time and money. Today, cordless tools are often used instead. In 1961, Black & Decker unveiled the first cordless power tool and, in the mid-60s, NASA started using battery-powered tools for their space programs, including a cordless rotary hammer drill for the Apollo moon program. Because these cordless power tools were designed for a zero-gravity environment, the weight of the batteries was not an issue. It wasn’t until the early 90s that I began trying battery-powered drills for the type of work I was doing. At that time, the batteries weren’t developed enough for me to be completely sold on cordless power tools. The 9.6-volt batteries were heavy, they had a long charging cycle time, they needed to be charged often, they got hot, the overall life expectancy was short, and replacement of the batteries was expensive. 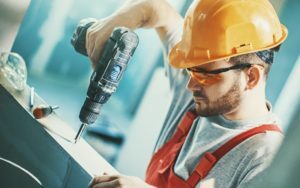 It wasn’t until the mid-2000s—when 18-volt and 24-volt batteries were available for screw guns, impacts wrenches, grinders, and skill saws—that cordless tools began to see everyday use on my job sites. Since those times, battery technology in both lithium-ion (Li-ion) and nickel cadmium (NiCd) has come a long way, prompting manufacturers to produce many other cordless tools, including miter and reciprocating saws, shop vacuums, nail guns, concrete vibrators, and even table saws that run off a 60-volt lithium-ion battery. Yet, despite advances in technology, there continues to be a debate between cordless and corded tools and which are better. I believe the better option differs depending on the work that needs to be done, the type of tool that will be used, and convenience factors. Below are some considerations when deciding between cordless and corded tools. 1.The up-front cost of cordless tools has to be evaluated, but any tool that can save labor hours is likely worth the investment. 2.Corded tools often require a powered extension cord. Repeatedly rolling out and rolling up extension cords takes time. In addition, electrical cords can be a tripping hazard, and blades or bits could damage cords and cause injury. 3.Cordless tools improve mobility, making it easier to move freely around a job site. 4.Today’s cordless tools have longer operating cycles, and downtime can be nearly eliminated by having one or two backup batteries on a charger. 5.Cordless tools often come with their own storage containers, making storage in trucks and gang boxes more convenient. 6.Corded tools maintain continuous torque and power, which can be an advantage for some jobs, such as drilling several large holes in concrete, using a concrete breaker, or ripping large quantities of lumber with a skill saw. With so many manufacturers in the power tool industry, it’s important to do your research before making a purchase. If you have experience using cordless power tools on job sites and would like to share your opinion, please feel free to do so. Construction workers who do the hands-on work are those we can learn the most from. Contact Beck Insurance Agency today for help on your contractors insurance and coverage.